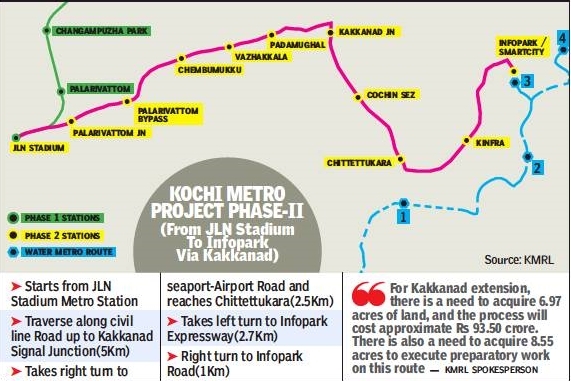 Giving a much-needed boost to the Kochi Metro rail project, the state cabinet accorded approval to extend the rail network from Jawaharlal Nehru stadium station to Infopark via Kakkanad. The approval for the 11.2 km stretch was given at the cabinet meeting held on Wednesday. 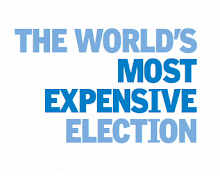 The project is estimated to cost Rs.2,310 crore. 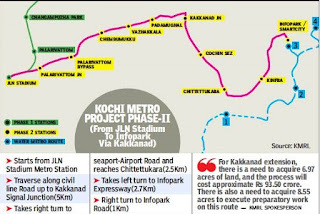 There will be 11 stations on the stretch, including JLN Stadium, Palarivattom Junction, Palarivattom Bypass, Chembumukku, Vazhakkala, Padamughal, Kunnumpuram, Kakkanad Junction, Kochi SEZ, Chittethukara, KINFRA and Infopark-1 . “For Kakkanad extension, there is a need to acquire 6.97 acres and the process will cost approximate Rs.93.50 crore. There is also a need to acquire 8.55 acres to execute preparatory work on this route,” said KMRL spokesperson. KMRL had engaged Rail India Technical and Economic Services to prepare technical feasibility study and detailed project report for various Metro corridors in July 2013 and they submitted the DPR for JLN stadium to Infopark under Phase-II to KMRL in February 2015. As per the revised DPR, Kochi Metro’s ridership is expected to touch 1.04 lakh by 2023. Apart from the employees at Infopark, the Metro is expected to serve those working at Ernakulam collectorate and several other state and centre government establishments at Kakkanad. Moreover, it will also improve the transportation facilities offered to public. Meanwhile, KMRL said that the social impact assessment study for extending the project to Kakkanad will be completed next month. The extension of Kochi Metro to Kakkanad is expected to bring down the travel time from city. As connectivity improves, it is expected to reduce traffic congestion in the city. Widening of the Palarivattom - Kakkanad stretch of the road as part of preparatory works will also help in improving transportation.